In France there’s a saying: long comme un jour sans pain, which literally means ‘as long as a day without bread’. French people use it when they talk about how awefuly long their day was, sitting in a cafe, dipping a piece of croissant in their café au lait. If you study French language, you’ll notice how many expressions are related to the word ‘bread’. 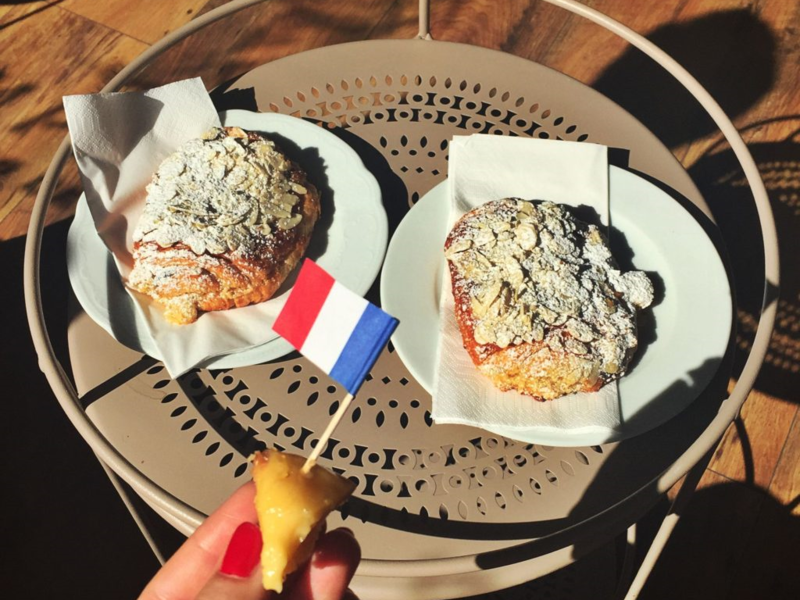 Can’t hide that French are crazy about their bread & pastries and they should be – who doesn’t love their crispy baguettes, thinner ficelles or delicious croissants? 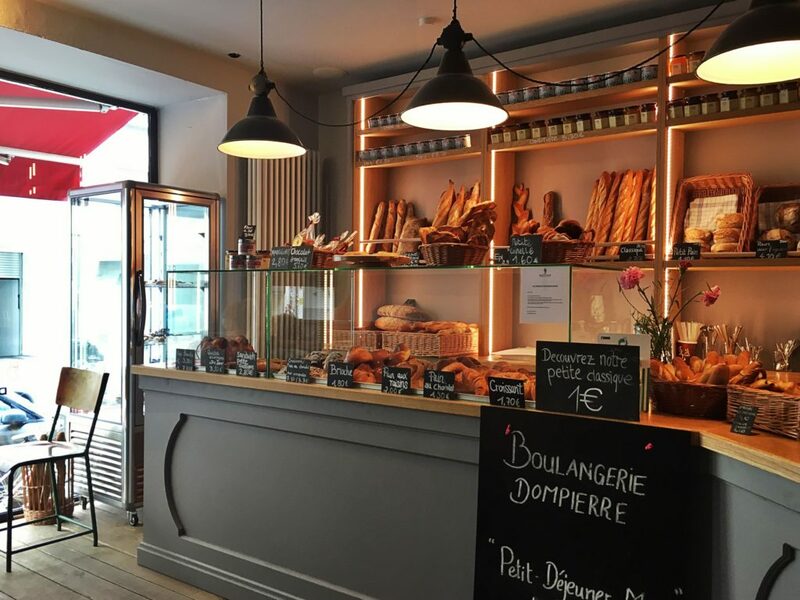 To rescue all these Bavarian souls longing for an original French bread, Thomas Häberle, an entrepreneur created a small chain of french bakeries – Boulangerie Dompierre – Douceurs de France. 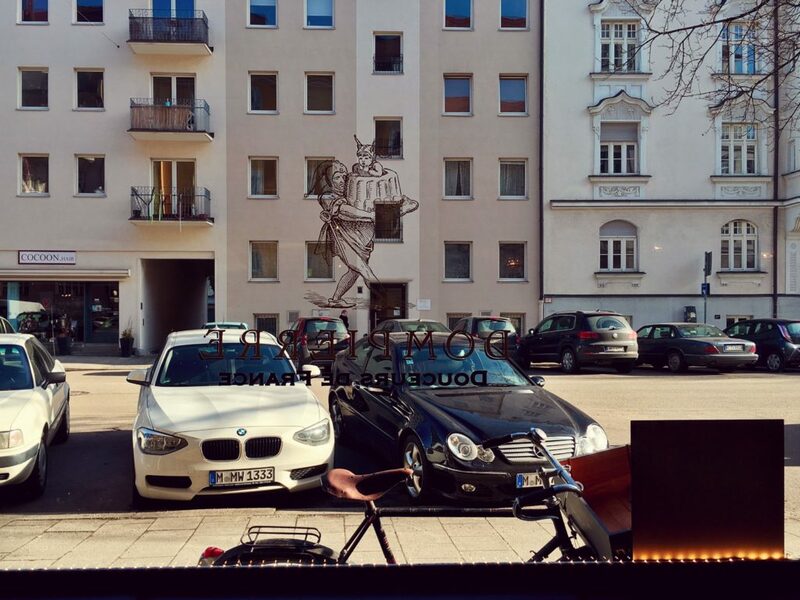 In Munich you can find three Dompierre bakeries: one in Schwabing next to Hohenzollernplatz, one in Schellingstraße close the University of Munich and the third one in Hans-Sachs-Straße. Munich wakes up pretty early – around 7 o’clock you can already notice people grabbing breakfast and their morning coffee. Bavarian people go to work, parents walk their children to the kindergarten. Being honest, I really hate getting up so early. Even back in my academic years, it was easier for me to stay up till 6am than to get up at this time. 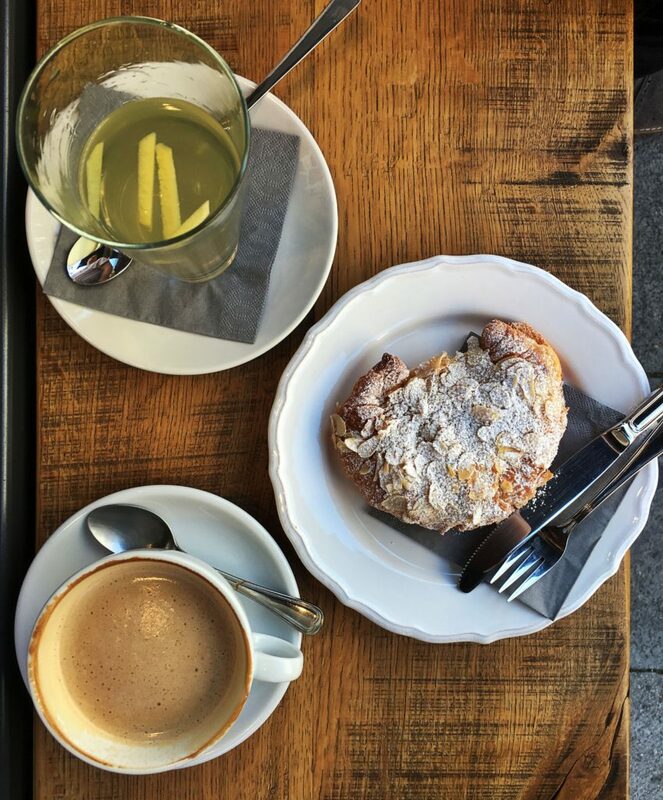 I also have a strong belief that every morning deserves a special celebration – and in the mouth of a foodie it means a proper breakfast. 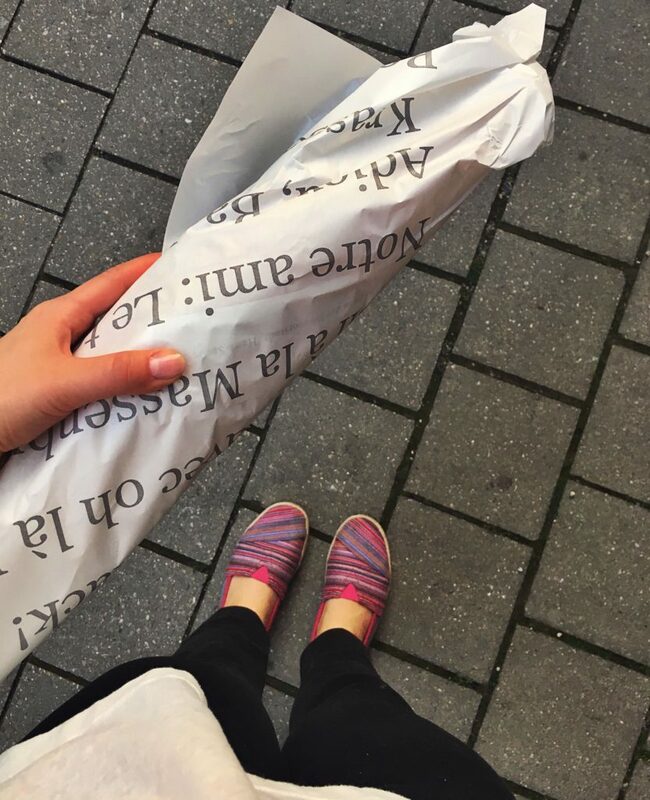 It’s a kind of a little reward for managing to put yourself together and get out of your warm bed 🙂 To receive my reward, I go straight to the Boulangerie Dompierre at Tengstraße. 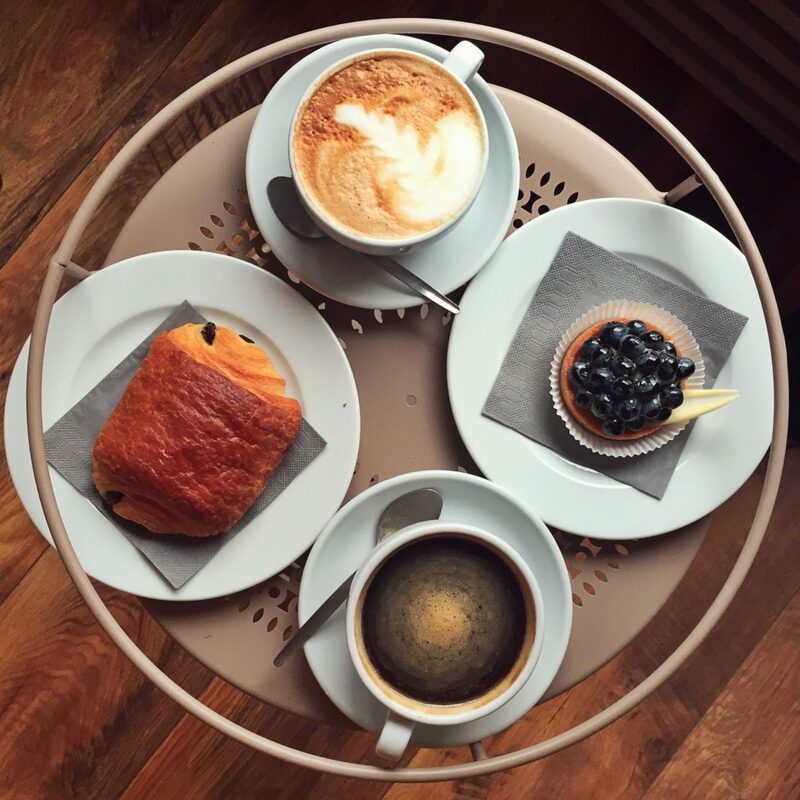 When I reached Dompierre, it turned out that I’m not the the only one who wants to have a proper, fine French breakfast. 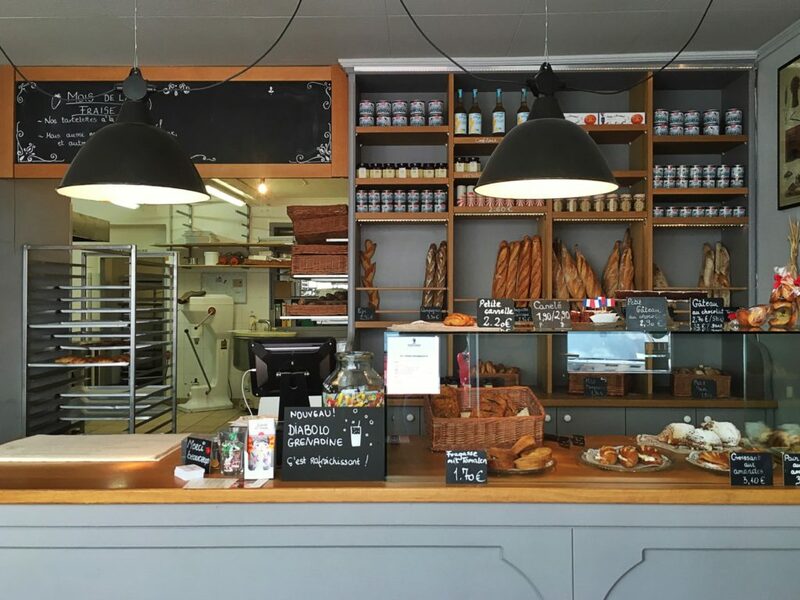 The Boulangerie has this warm and inviting inside with a wide French-styled counter and walls painted in purple-heather color. 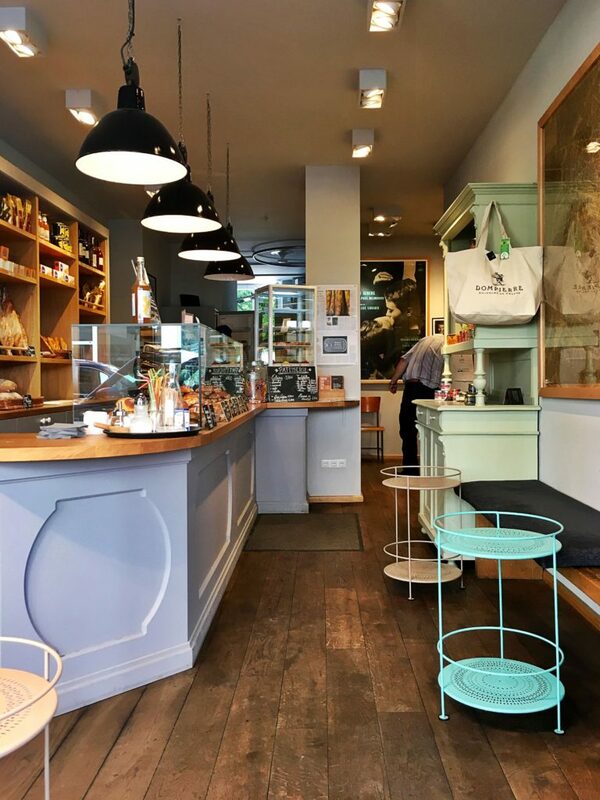 Boulangerie Dompierre isn’t big, but a smart move of using a windowsill as a seat gives it some extra space. 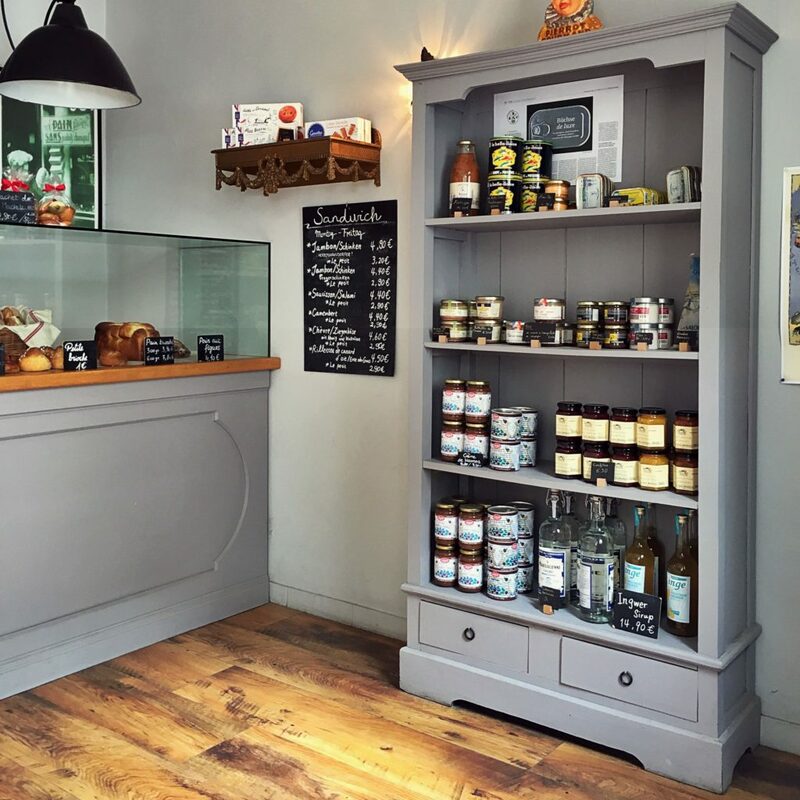 On the shelves you’ll find original French products you can buy & bring home with you: fruit marmalades, chestnut spreads, ginger lemonade and fois gras. 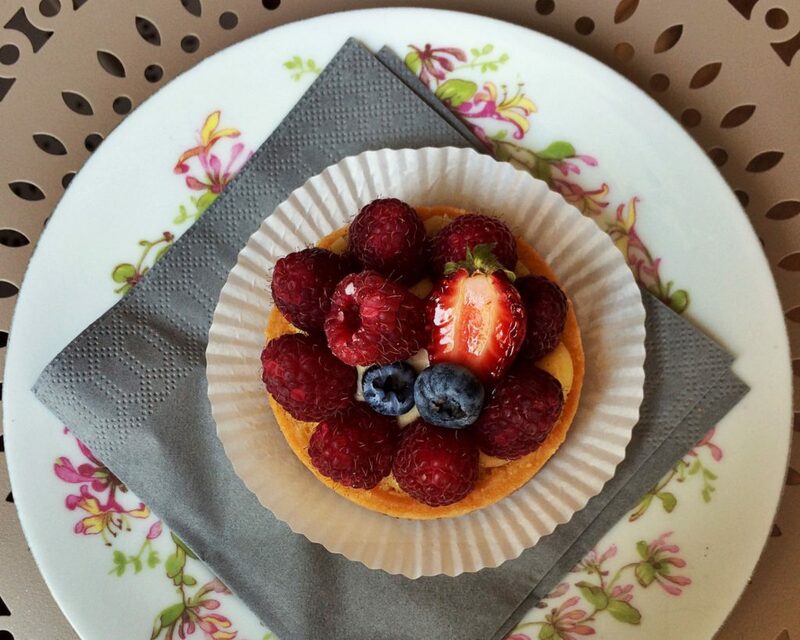 That’s another thing I really love about Boulangerie Dompierre: they are as French as they can be. If it is mineral water – it must be Perrier, if orangeade – it is of a French brand, Orangina. 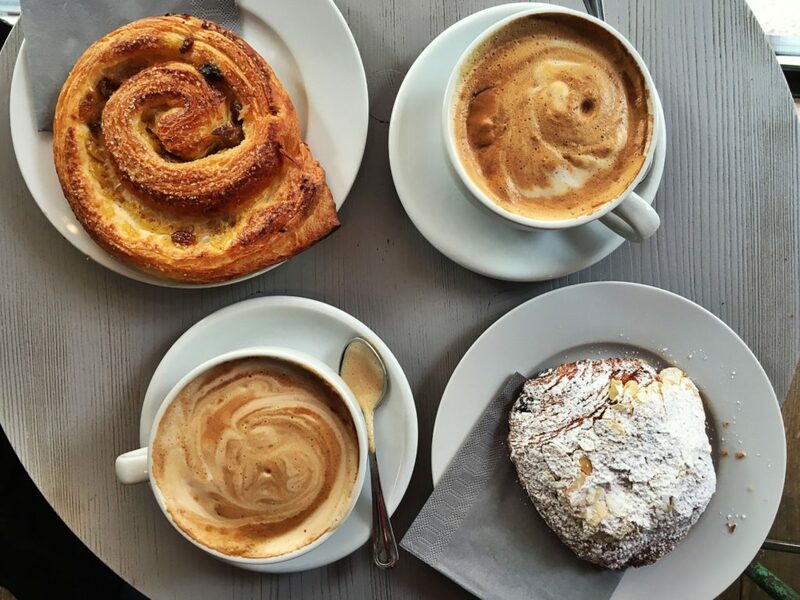 In Munich you can find hundreds of bakeries, including the French ones, but none of them can offer you products more authentic than Boulangerie Dompierre. 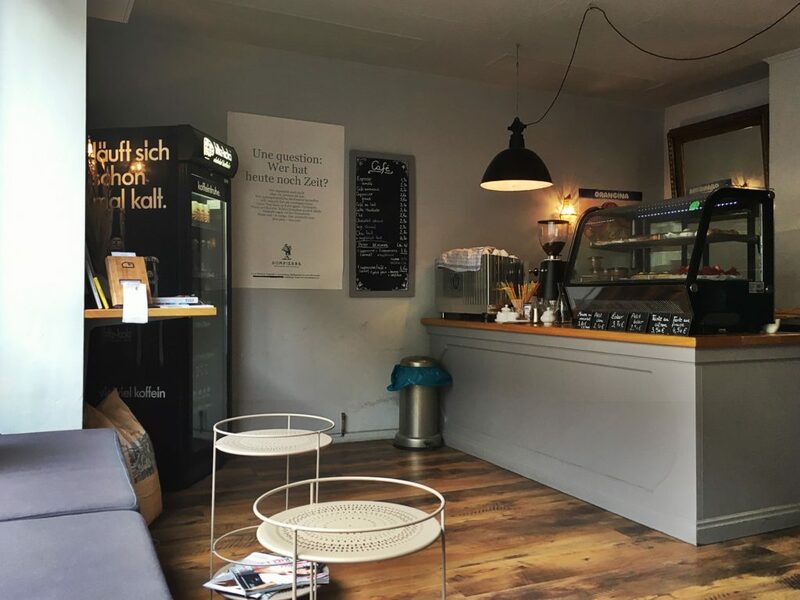 They make it simple: use natural ingredients only – flour, salt and yeats, don’t add any additives or preservatives, and take every stage of the production process very deeply to their hearts. 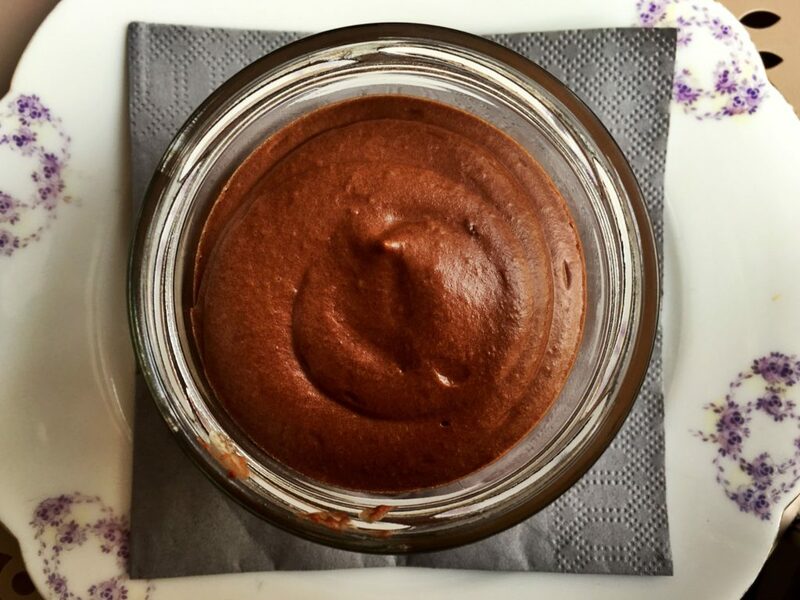 Dompierre relies on the original French recipes. 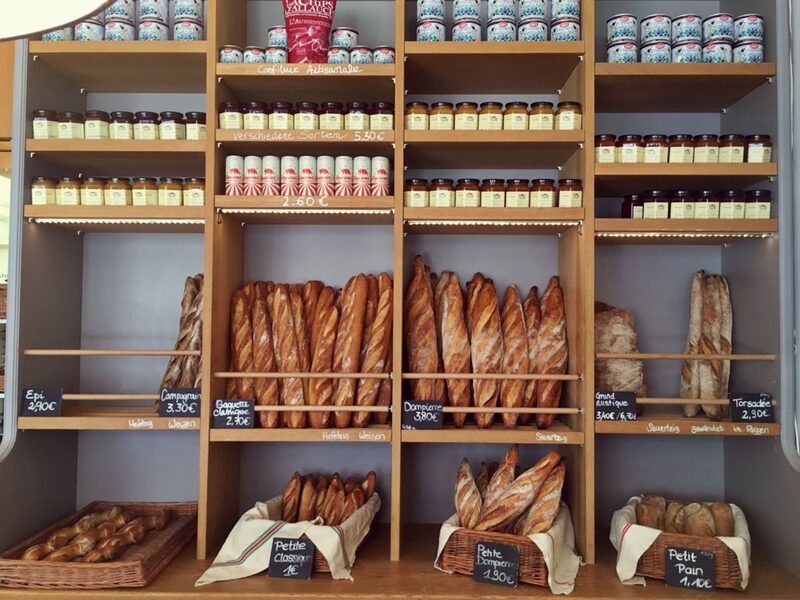 Also, Boulangerie trades on flour that comes straight from an old traditional mill located near Paris! 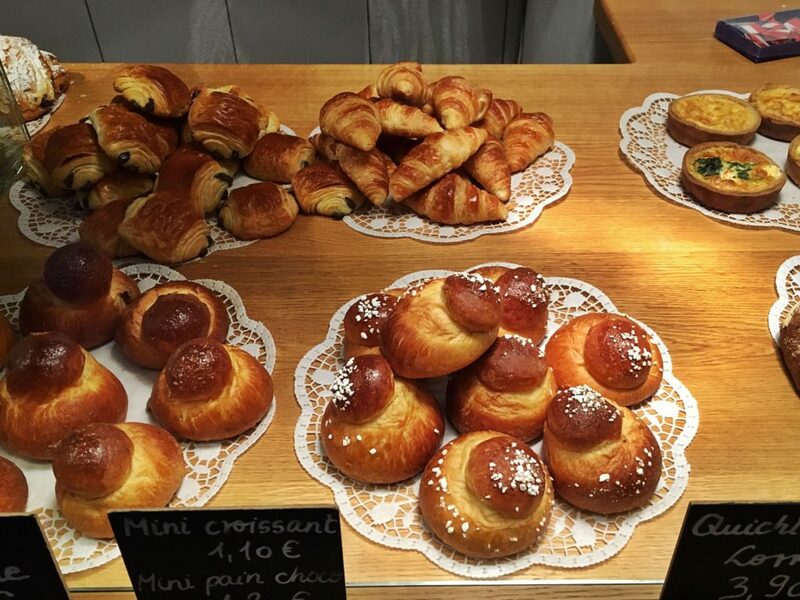 It is that special attention to the smallest detail and a strong passion for baking that makes Dompierre’s baguettes and pastries so delicious and of a high-quality. Munich is a highly developed city and people living here are well-educated and therefore, they belong to the demanding customers. They don’t mind paying a little bit more for a better quality. Boulangerie Dompierre is definitely not the cheapest bakery in Munich, but people are willing to wait in queues, sometimes even on the steet to get their delicous fig and walnut bread or tender baguettes and croissants. It only proves that Dompierre is totally worth its price! Another thing I really like about Boulangerie Dompierre is that they always decorate their pastries depending on the season. During the Xmas Time you can order this cute, drenched in chocolate Bûche de Noël, traditionally eaten by French after coming back from the Christmas midnight mass. 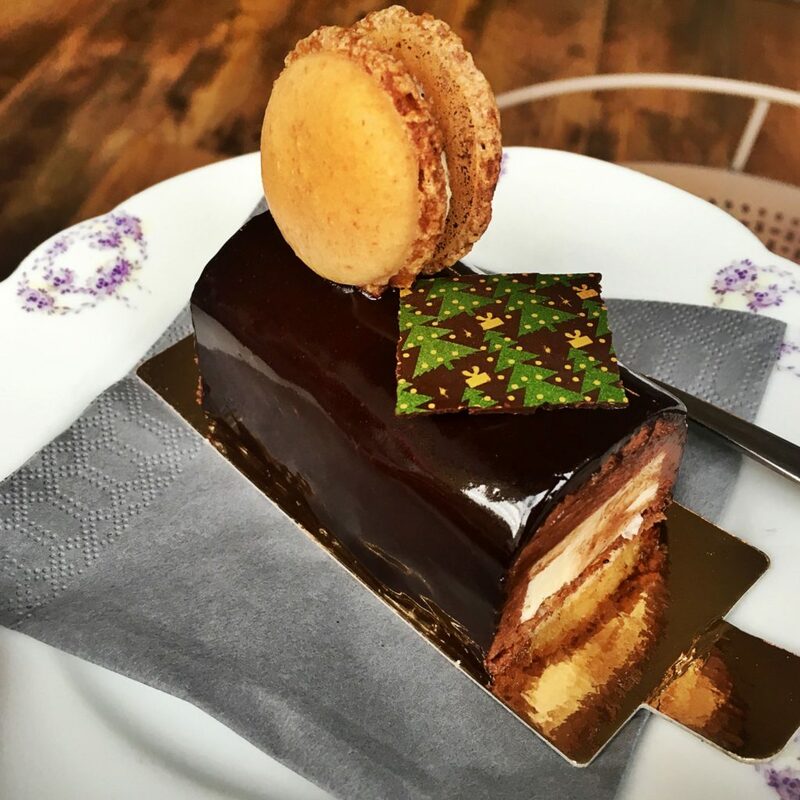 Dompierre serves their Bûche de Noël with a French macaron and Xmas tree motives 🙂 I find it really French and charming and again – soooo delicious! 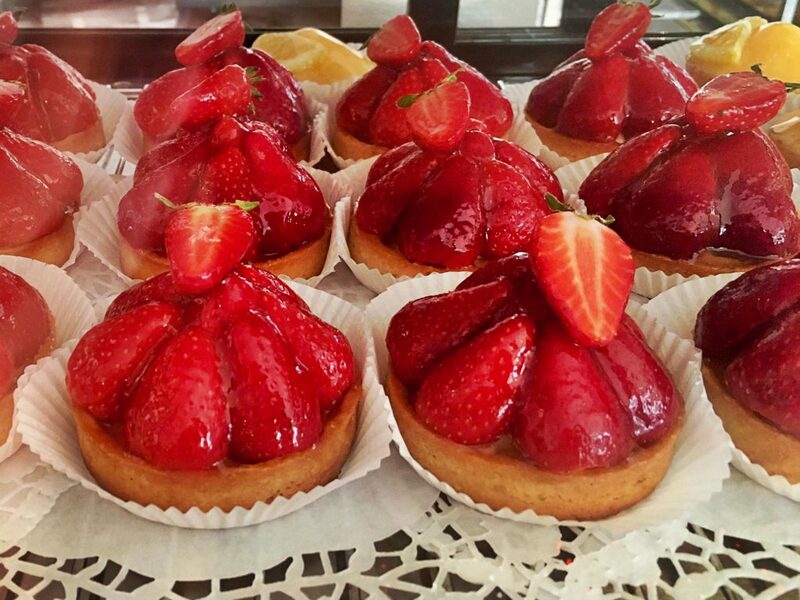 You can also go for a classic butter croissant, seasonal fruit tart or pain au chocolat, beloved by children. For reasons unknown to me all my male friends I take to Dompierre, choose pain au raisin – it’s quite tasty too. 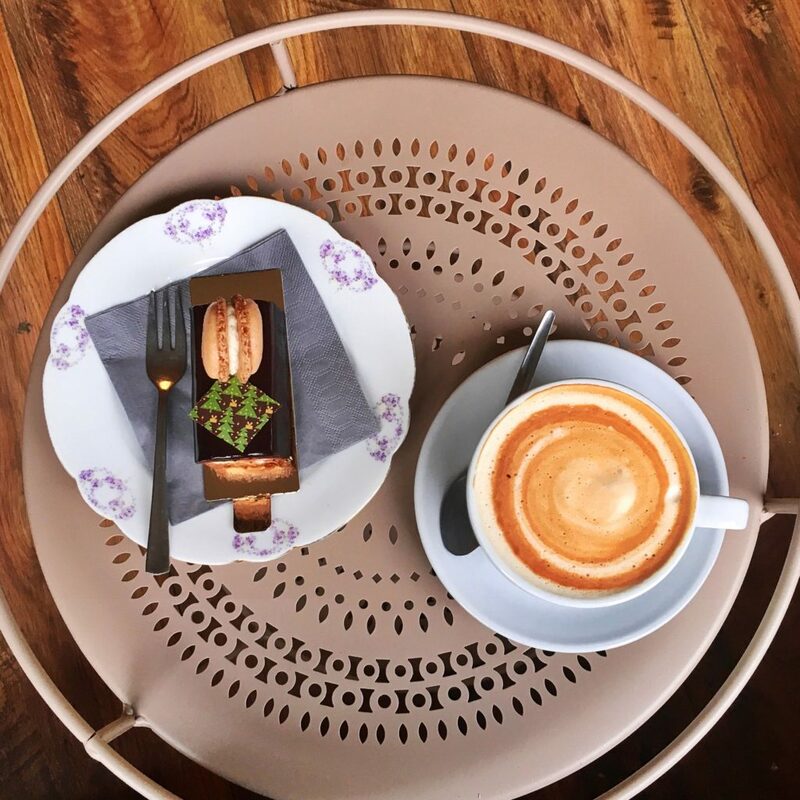 I would also suggest you to try their tarte au citron and one of Dompierre’s éclairs with chocolate, vanilla, coffee or salty caramel filling – every kind under the sun. 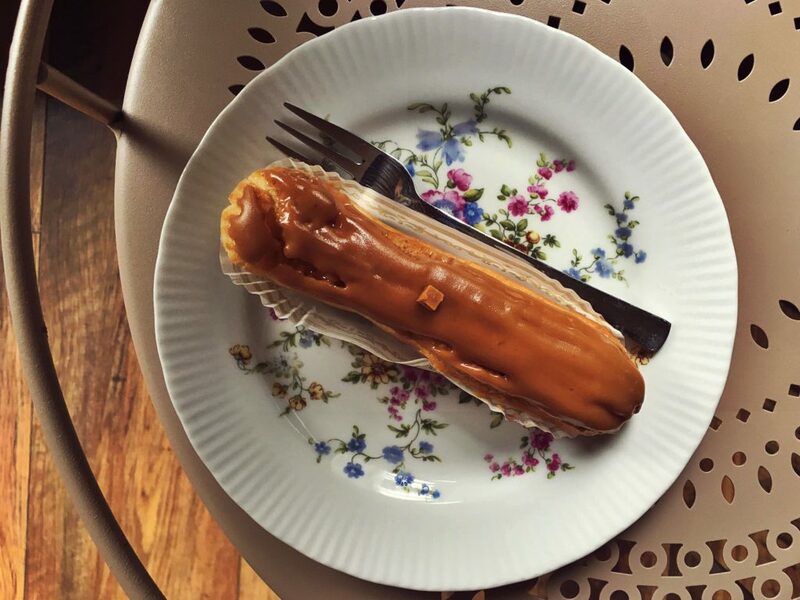 I’ll never forget my brother’s face once I brought him Dompierre’s éclair – he sincerely said – I have never ever tried anything more tasty in my life! 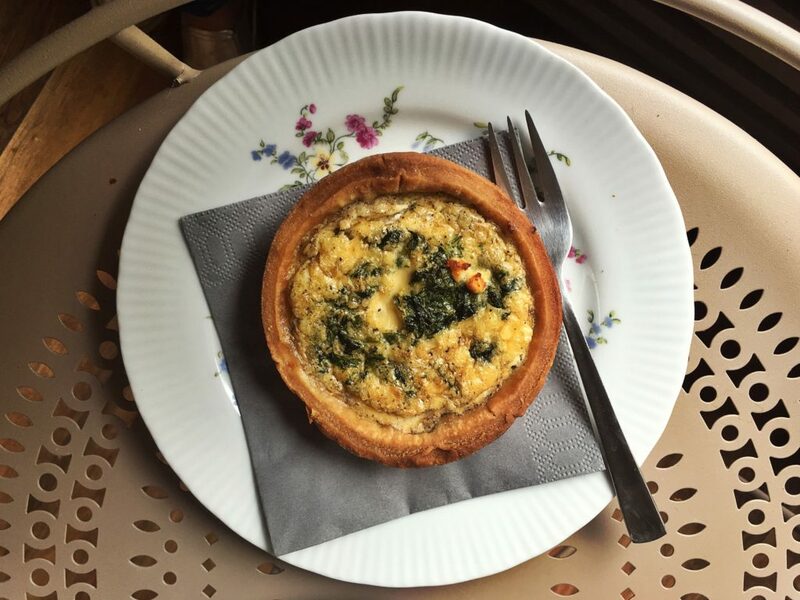 For those not really into the ‘sweet stuff’, Boulangerie Dompierre offers very popular fougasse – a type of French olive bread, quiche (yummy!) and a wide range of sandwiches. 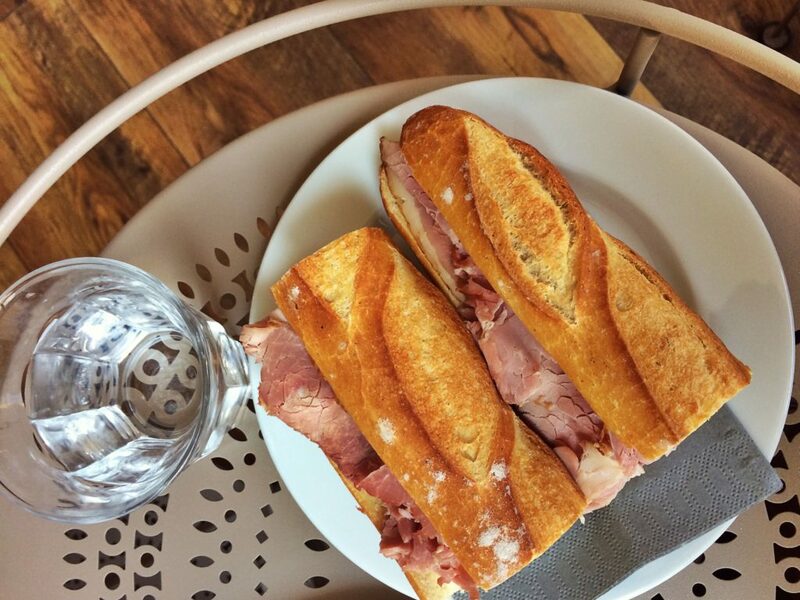 With Dompierre’s bread, salmon, ham, goat cheese, brie – you can compose a sandwich on your own. 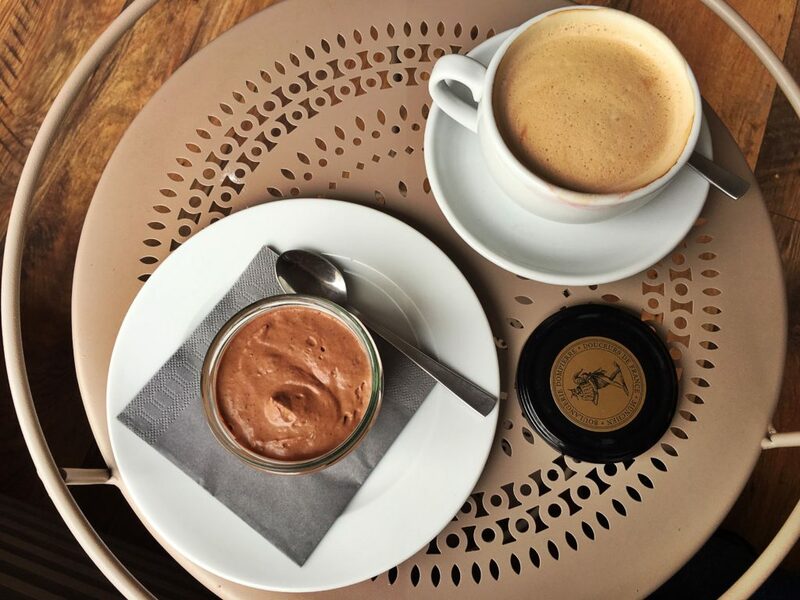 I can recommend you a classic butter and ham sandwich – it reminds me a lot of Parisian breakfast on Boulevard Saint Germain- truly French, simple and absolutely savory. 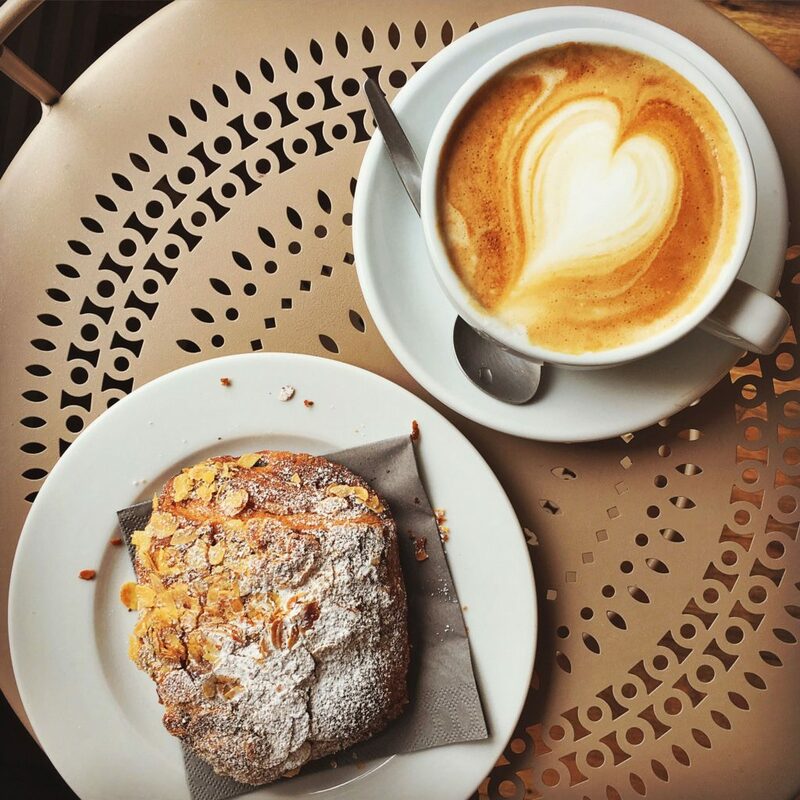 As a diagnosed coffeeholic, I need to praise Dompierre’s coffee. 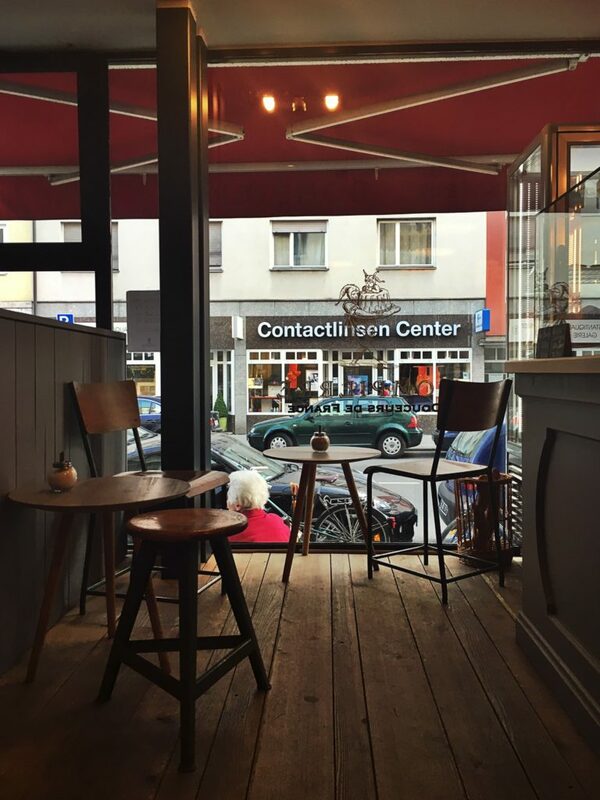 From my point of view my it is one of the best in Schwabing. 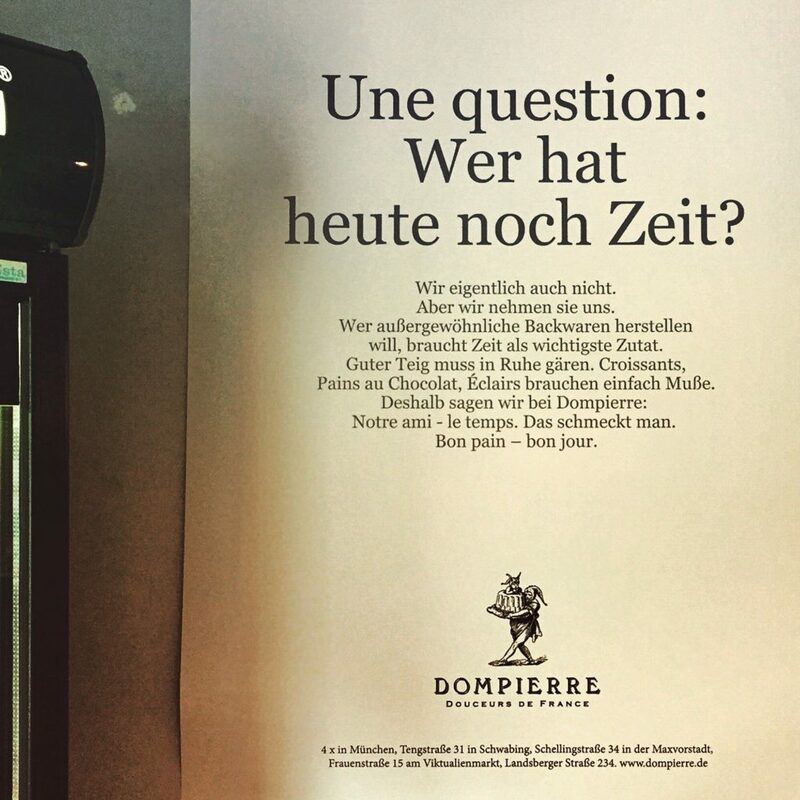 I also love this Boulangerie for their opening hours – when most of the coffeeshops in Munich close at 5pm or 6pm, Dompierre still serves you with coffee up till 7pm during the weekdays. Whenever you come, you’re always wholeheartedly greeted by Dompierre’s staff. They’re very friendly and some of them actually speak French or have French roots! You can really say they do like working there and that makes you want to stay in Dompierre even longer. 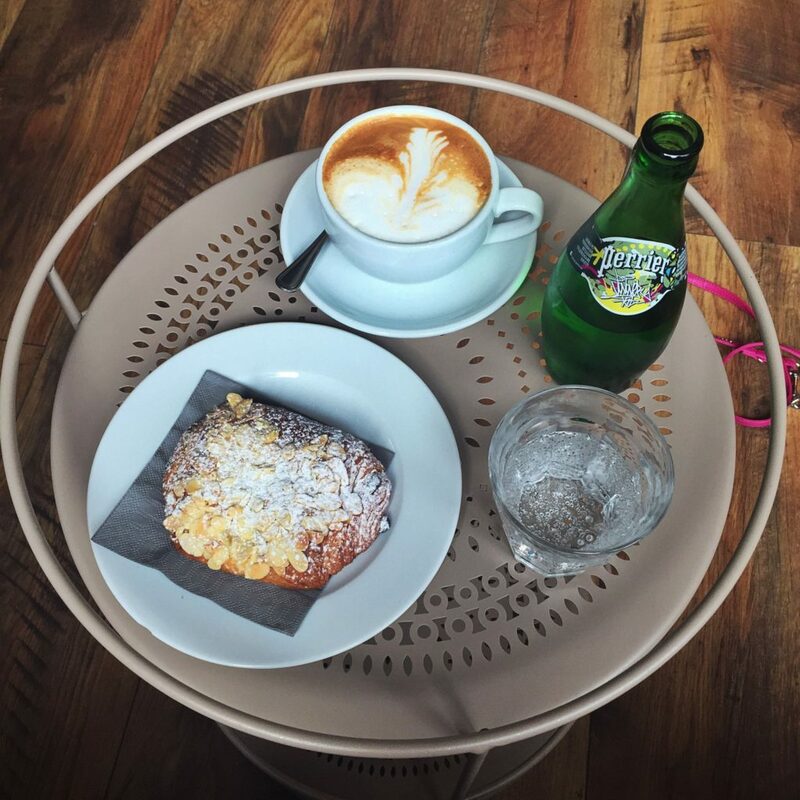 I think it’s essential in building a right atmosphere of Boulangerie Dompierre – Douceurs de France. Alors – Mesdames et Messieurs! Bon Appétit! Thank you so much for giving everyone a very remarkable possiblity to read articles and blog posts from this website. 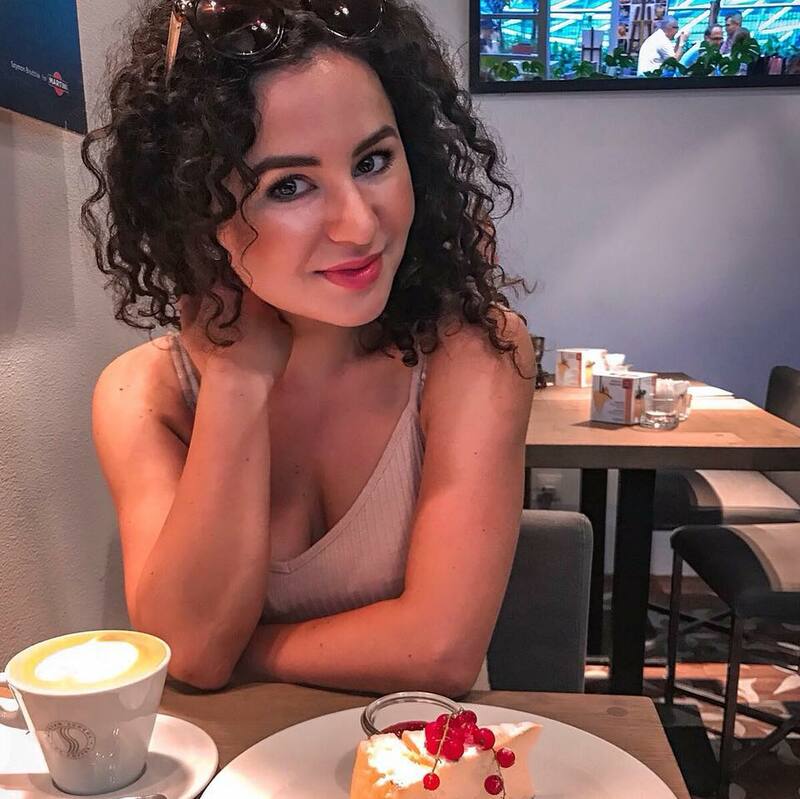 It is usually so awesome plus packed with a lot of fun for me personally and my office peers to visit your site a minimum of 3 times in a week to study the newest secrets you will have. And lastly, I am just usually fulfilled for the effective inspiring ideas you give. Certain 2 points on this page are basically the most suitable I’ve had. KnqzlV Really appreciate you sharing this blog.Thanks Again. Lebanese lunch in the shopping mall?